The first internment camps were opened during the First World War (1914–1918) to detain civilian prisoners (mainly German, Austro-Hungarian and Ottoman). These prisoners were detained in Pontmain in the department of Mayenne, Fort-Barreaux in Isère, in the military camp of Graveson (Bouches-du-Rhône), in Frigolet near Tarascon (Bouches-du-Rhône), Noirlac (Abbey) (Cher), and Ajain(Creuse). Other internment camps were used for Armenians in the 1920s-1930s (Mirabeau camp, Victor Hugo camp and Oddo Camp in Marseille); Gypsies after the 1912 Act on nomadism (for instance in the Royal Saltworks at Arc-et-Senans, but also in iron mines in the Manche and other disaffected industrial centers in Mayenne, in the Manche, in Loire-Atlantique, in the Sarthe, in the Maine-et-Loire, etc.). 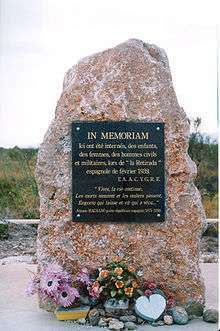 Commemorative stele for survivors of the retirada at Camp de Rivesaltes. Camp Gurs in the Pyrénées-Atlantiques, which received Spanish refugees following the defeat of the Spanish Republic. These were distinguished by the French state into Brigadists, gudaris (Basque nationalists) who had escaped from the siege of Santander, pilots, and farmers. The latter had trades that were in low demand, and the French government, in agreement with the Francoist government, incited them to return to Spain. The great majority did so and were turned over to the Francoist authorities in Irún. From there they were transferred to the Miranda de Ebro camp for purification according to the Law of Political Responsibilities. Camp Vernet near Pamiers, in the Ariège. Moisdon-la-Rivière and Juigné-des-Moutiers in Loire-Atlantique department (Brittany). The Camp de Rivesaltes, in the department of Pyrénées-Orientales. The Jewish detainees were sent to Drancy internment camp, near Paris, the Gypsies to Saliers and the Spaniards to camp Gurs. To these camps must be added the camps for the German prisoners in 1939 (sometimes overlapping with those above), and those of the Colonial Empire, not well known in Europe. Furthermore, the Chilean poet Pablo Neruda, who had been named Consul in Paris for Immigration, organized the transportation to Chile of 2,200 Spanish refugees who had been detained in the camps on board the Winnipeg, which departed on 2 August 1939, and arrived in Valparaíso at the beginning of September 1939. As early as 1939, the existing camps were indiscriminately filled with German anti-Nazis (Communists, German Jews, etc.) or pro-Nazi Germans or also Nazi prisoners of war. Following the 1940 defeat, and the 10 July 1940 vote of full powers installing the Vichy regime, these camps were filled with Jews, first with foreign Jews, then indifferently with foreign and French Jews. 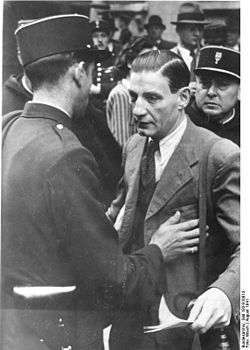 The Vichy government would progressively hand them up to the Gestapo, and they would all transit by Drancy internment camp, the last stop before concentration camps in the Third Reich and in Eastern Europe and the extermination camps. 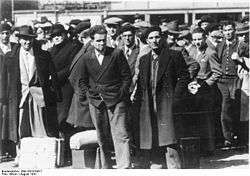 Beside Jews, Germans and Austrians were immediately rounded-up in camps, as well as Spanish refugees, who were later deported. 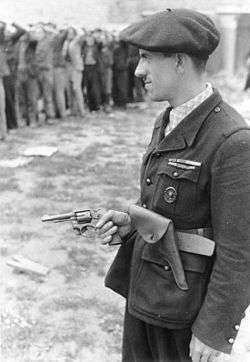 5,000 Spaniards thus died in Mauthausen concentration camp. The French colonial soldiers were interned by the Germans on French territory, instead of being deported. The Third Republic and the Vichy regime would successively call these places "reception camps" ("camps d'accueil"), "internment camps" ("camps d'internement"), "sojourn camps" ("camps de séjour"), "guarded sojourn camps" ("camps de séjour surveillés"), "prisoner camps" ("camps de prisonniers"), etc. 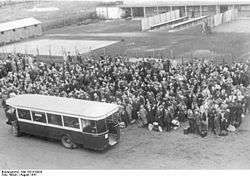 Another category was created by the Vichy regime: the "transit camps" ("camps de transit"), referring to the fact the detainees were to be deported to Germany. Such "transit camps" included Drancy, Pithiviers, etc. During the 1943 "Battle of Marseille" and urban scaping operations in the center of town, 20,000 people were expelled from their homes and interned during several months in military camps nearby Fréjus (La Lègue, Caïs and Puget). There were no extermination camps in France. However, the camp of Struthof, or Natzweiler-Struthof, in Alsace, which is the only concentration camp created by Nazis on French territory (annexed by the Third Reich) did include a gas chamber which was used to exterminate at least 86 detainees (mostly Jewish) with the aim of constituting a collection of preserved skeletons (as this mode of execution did no damage to the skeletons themselves) for the use of Nazi professor August Hirt. Bourg-Lastic in the Puy de Dôme, a former military camp where Jews where detained (André Glucksmann was detained there during four years). The camp was used to intern Harkis in the 1960s and Kurdish refugees from Iraq in the 1980s (see below). Camp of Royallieu in Compiègne in Picardie (June 1941 to August 1944). It was used to intern the Jewish detainees arrested during the January 1943 Battle of Marseille. Robert Desnos (1900–1945) and famous French Resistant Jean Moulin (1899–1943) transited through this camp. Fort-Barraux in the department of Isère. It had already been used as a prison during the French Revolution; Antoine Barnave was imprisoned there. Gurs internment camp in the Pyrénées-Atlantiques, created in 1939 for the Spanish refugees. 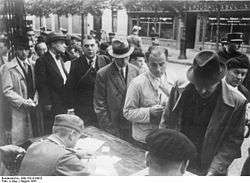 During the Phony War, the Third Republic used it to intern "indésirables", that is Germans who were found in France, without regard to ethnicity or political orientation, as foreign citizens of an enemy power. Among them stands out a significant number of German Jews who had fled the very Nazi regime; citizens of countries who were in the orbit of the Reich, like Austria, Protectorate of Bohemia and Moravia, Slovak Republic, Fascist Italy, or Poland; French activists of the left (trade unionists, socialists, anarchists, and especially, communists), following the proscription of the Parti Communiste Français (PCF) by Daladier after the German-Soviet Non-aggression Pact; the first of these arrived 21 June 1940, and the majority were relocated in other camps before the end of the year. 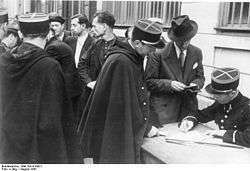 In Gurs were also interned during this period: anti-militarists, representatives of the French extreme right who sympathized with the Nazi regime, ordinary prisoners evacuated from prisons in the north of the country ahead of the German advance, common criminals awaiting trial. Then, under Vichy, Camp Gurs was used to detain foreign Jews, German Jews deported by the SS from southern Germany, persons who had illegally crossed the border of the zone occupied by the Germans, Spaniards fleeing Francoist Spain, Spaniards coming from other camps that had been condemned for being uninhabitable or due to their scarce contingent, stateless persons, people involved in prostitution, homosexuals, Gypsies and indigents. Mérignac in the Gironde. This is where Maurice Papon had Jews of the Bordeaux region interned before going to Drancy. Among others, Robert Aron was detained there. Camp des Milles near Aix-en-Provence in the Bouches-du-Rhône, which was the largest internment camp in the southeast of France. 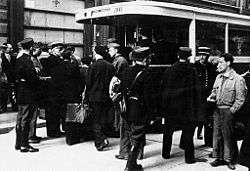 2,500 Jews were deported from there following the August 1942 raids. Novelist Lion Feuchtwanger, Surrealist artists Hans Bellmer and Max Ernst were among the most famous inmates detained in this concentration camp. Pithiviers transit camp in Pithiviers. Jewish novelist Irène Némirovsky (1903–1942) was interned there. Fort de Romainville ("Fort of Romainville"), was a Nazi prison, located in the outskirts of Paris. The Fort was invested in 1940 by the German military and transformed into a prison. From there, resistance members and hostages were directed to the Nazi concentration camps: 3,900 women and 3,100 men were interned before being deported to Auschwitz, Ravensbrück, Buchenwald and Dachau. 152 persons were executed by firing-squad in the Fort itself. A few escaped, such as Pierre Georges, alias "Colonel Fabien." From her cell, Danielle Casanova, motivated and encouraged her comrades to confront their torturers. From October 1940, the Fort held only female prisoners (resistance members and hostages), who were jailed, executed or redirected to the Nazi concentration camps outside France. At the time of the Liberation in August 1944, many abandoned corpses were found in the Fort's yard. Saint-Cyprien in the Pyrénées-Orientales. 90,000 Spanish refugees were interned there in March 1939, and it was officially closed on 19 December 1940 for "sanitary reasons", its occupants transferred to the Camp of Gurs. Saint-Sulpice-la-Pointe. Located near Toulouse, this transit camp was set up after the beginning of the Phony War. It was to house "individuals representing a danger to national security" - mostly militant communists. In June 1940, with the first German attacks on the Soviet Union, people with Russian citizenship were interned there. Later, foreign Jews who had been living in hiding in the south of France and were rounded up in the summer of 1942 were also sent to the camp. The inmates, especially the communists, organized many cultural activities, a "little university", in which each one contributed their knowledge for the collective good. From the summer of 1942 to the closing of the camp in August 1944, most of its inmates were deported to camps in Eastern Europe, to Auschwitz and Buchenwald. Le Vernet Internment Camp in the Ariège which concentrated 12,000 Spanish refugees as early as 1939. It was used later on for the internment of the harkis. Woippy in the department of Moselle, created in 1943. The Nazis also opened Struthof in Alsace (in the part annexed by the Reich). The United States military police also possessed legal authority over the camp in Septèmes-les-Vallons, in the Bouches-du-Rhône. Ilag (for Internierunslager) were internment camps established by the German Army to hold Allied civilians, captured in areas that were occupied by the Germans. 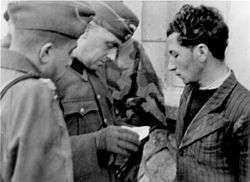 They included US citizens caught in Europe by surprise when the war was declared in December 1941 and citizens of the British Commonwealth caught in areas engulfed by the Blitzkrieg. Besançon in the Doubs (in the Vauban barracks). Also called Frontstalag 142, it was actually an internment camp. At the end of 1940, 2,400 women, mostly British, were interned in the Vauban barracks and another five hundred, old and sick, in the St. Jacques hospital close by. In early 1941, many of them were released, the rest were transferred to Vittel. Vittel, Frontstalag 121 was located in requisitioned hotels in this spa near Epinal in the Vosges department. Most of the British families and single women were transferred here from Saint-Denis and Besançon. In early 1942, women over sixty, men over seventy-five and children under sixteen were released. The overall population was thus reduced to about 2,400. The inmates included a number of North-American families and women. Although not architecturally conceived as an internment camp, the Vel' d'Hiv (Winter Velodrome) was used during the July 1942 Roundup. Most internment camps, however, were not conceived as such. The Vel d'Hiv was also used during the Algerian War (see below). Camps were also used after the Liberation to intern German prisoners. In Rennes, after General Patton's United States Third Army liberated the city on 4 August 1944, about 50,000 German prisoners were kept in four camps in a city of 100,000 inhabitants at the time. In the Camp de Rivesaltes, the German prisoners worked extensively in the reconstruction of Pyrénées-Orientales, but between May 1945 and 1946, 412 German prisoners of war died in the camp. Internment camps were used to receive French from Indochina following the end of the Indochina War in 1954, as well as approximatively 9,000 Hungarian refugees following the Budapest insurrection of 1956 (in Annecy, Colmar—Caserne Valter—, in Gap, in Le Havre, in Metz—Caserne Raffenel, in Montdauphin, in Montluçon—Caserne de Richemond—, in Nancy (camp de Chatelleraud), in Poitiers, in Rennes, in Rouen, in Strasbourg—caserne Stirn—and in Valdahon). Humanitarian concerns largely intertwined with repressive aims, and internment restrictions and assistance given to populations varied widely (Hungarian refugees were better treated than French from Indochina). Internment was also put to use during the Algerian War (1954–1962), generally under the name of "camps de regroupement" ("regrouping camps"). Within Algeria, the colonial administration used a form of camps as a counter-insurgency tactic, with up to 2 millions civilians being internally deported in villages de regroupement) to prevent their falling under the influence of the opposing FLN forces. were brought to French metropolitan territory. 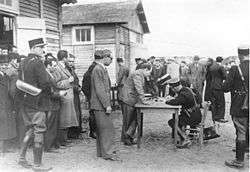 In France, some camps used under Vichy were opened again, in Paris in particular, to hold suspected FLN and other Algerian independentists. Internment camps were also used to intern the harkis (Algerians who fought on the French Army's side) after the 19 March 1962 Évian Accords which put an official end to the war. Finally, the Camp de Rivesaltes in the Pyrénées-Orientales, and Bourg-Lastic in the Puy de Dôme, used to intern Jews, were also used to intern harkis in the 1960s, and Kurdish refugees from Iraq in the 1980s. ↑ Maurice Rajsfus, Drancy, un camp de concentration très ordinaire, Cherche Midi éditeur (2005). 1 2 Bernardot, Marc (2008). Camps d'étrangers (in French). Paris: Terra. pp. 145–146. ISBN 9782914968409. 1 2 Bernardot, Marc (2008). Camps d'étrangers (in French). Paris: Terra. pp. 142–143. ISBN 9782914968409. ↑ Bernardot, Marc (2008). Camps d'étrangers (in French). Paris: Terra. p. 130. ISBN 9782914968409. ↑ Bernardot, Marc (2008). Camps d'étrangers (in French). Paris: Terra. p. 132. ISBN 9782914968409. ↑ Bernardot, Marc (2008). Camps d'étrangers (in French). Paris: Terra. p. 129. ISBN 9782914968409. ↑ United States Holocaust Memorial Museum. "Drancy" article for the Holocaust Encyclopedia (accessed July 5, 2009). ↑ Bernardot, Marc (2008). Camps d'étrangers (in French). Paris: Terra. p. 53. ISBN 9782914968409. ↑ Bernardot, Marc (2008). Camps d'étrangers (in French). Paris: Terra. ISBN 9782914968409. 1 2 3 Bernardot, Marc (2008). Camps d'étrangers (in French). Paris: Terra. pp. 125–126. ISBN 9782914968409. ↑ Bernardot, Marc (2008). Camps d'étrangers (in French). Paris: Terra. p. 127. ISBN 9782914968409. La SNCF sous l'Occupation allemande. Institut du temps présent, CNRS. 1996. Rajsfus, Maurice (2005). Drancy, un camp de concentration très ordinaire, 1941–1944. Le Cherche-midi éditeur. ISBN 2-86274-435-2. Steinbeck, Madeleine (January–March 1990). "Les camps de Besançon et de Vittel". Le Monde Juif. 137. Fontaine, Thomas (2005). Les oubliés de Romainville. Un camp allemand en France (1940–1944). Paris: Taillandier. ISBN 2847342176.